"The trackball, a related pointing device [to the mouse], was invented by Tom Cranston, Fred Longstaff and Kenyon Taylor working on the Royal Canadian Navy's DATAR project in 1952. It used a standard Canadian five-pin bowling ball. It was not patented, as it was a secret military project." (Source: Wikipedia). Is it scary to think that the concept of a computer mouse is almost 50 years old? Back then, it was a very primitive and bulky device; nowadays, it even comes with its own processor. Well, at least the SteelSeries Sensei comes with its own built-in processor, and many other features which I will get into later. As a gamer, the mouse is an absolute critical part of when playing almost any game. In fact, only a select few games can be played without a mouse, and even fewer of them are played competitively. In the click-centric world of PC games, it is obvious that if you want to dominate in games, you will need to have a good mouse, and certainly a good keyboard wouldn't hurt either. The Sensei offers seven mouse buttons, which for many non-gamers might sound absurd, but any serious gamer understands the power of having extra buttons. Looking back, I almost find it funny how I used to think two buttons on a mouse was plenty for my Pentium computer, or even further back, the one button mouse on the Apple II. While the horror of using a one button mouse without a scroll wheel sinks in, let's take a look at the SteelSeries Sensei and its seven buttons. The SteelSeries Sensei came to our offices in Calgary all the way from Japan Chicago, Illinois in a standard brown cardboard box. For a computer mouse, this is a pretty typical way for the products to be shipped to us. The master's journey went smoothly, and there was virtually no damage to the shipping box, thanks to UPS Standard. Well, as always, it's time to pull the mentor out of the box, and take a look at what we got for ourselves today. When it comes to retail boxes for computer peripherals and electronics, in some cases, the product is displayed in clear plastic. This is exactly the way it should be done. My rationale for this is consumers need to see exactly what they are putting their hands on. While a retail box can have descriptive text or even an informative image on the front that is worth a thousand words, being able to see the actual product is far more effective in my personal opinion. SteelSeries did an excellent job in regards to the design of the Sensei's retail box. On the front, the company and product name is displayed, with a minor caption at the top left corner. At the bottom left, there is a bold statement about it being "the world's most customizable mouse"; at the bottom right corner, there is the logo. Finally, while looking at the middle, you will see an image of the mouse itself. The overall design is simple, but it gets the point across. However, an interesting twist is the front also opens up like a book. This allows the consumer to can see the mouse itself, and on the inside cover is a summary for those interested in more information. Clearly, these guys (SteelSeries) know what they are doing when it comes to designing retail boxes. I only hope that continue to show their knowledge as we look deeper into the Sensei. A mouse as powerful as a Pentium computer? Yes. Really. The most customizable mouse in the world. Whatever you want, however you want it. Fnatic, SK, EG, Na'Vi, EHOME, TyLoo. LoL, HoN, CS, SC2, DotA. They were all in on it. Get your own lift distance regardless of surface. Always. You have the authority now. Via the built-in menu, you can customize on the go - at the touch of your scroll wheel. The ambidextrous shape of the Sensei suits righties and lefties equally. 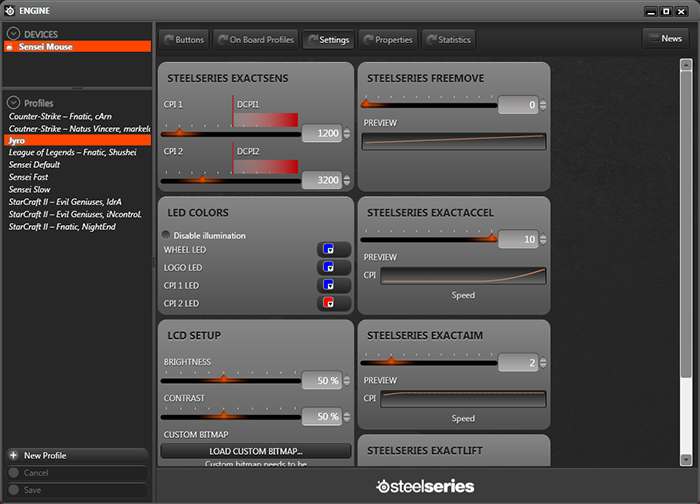 PC gamers will benefit fully from the SteelSeries Engine software. Default CPI range: 1 to 5,700 CPI. Double CPI range: 5701 to 11,400 CPI. As it should be no shocker at this point, the SteelSeries Sensei comes with a braided USB cable. The reason for this is the friction offered by a plastic cable is significantly higher, and it is more likely to get tangled. Another wonderful benefit of braided cables is the increased durability it provides. This is because it is a more durable material, and even if the braiding does wear off after a few years, the actual cable is still covered with plastic underneath. The USB plug itself has a pleasant gold color to it, which offers nothing other than being good to look at. As mentioned earlier, the top of the SteelSeries Sensei is highly reflective; almost like a slightly foggy mirror, with the rest being simply black. When unplugged, the mouse itself isn't very stunning, but once plugged in, you can tinker around with a number of lights and colors to suit your visual appeal. Lights are located at the following places: The sides of the wheel, the middle of the mouse right behind the wheel, and near your wrist where the logo lights up. While your hand is over the mouse, all of these lights will basically be covered, so it really only gives it a nice look when you are typing with both hands. As mentioned before, the top of the mouse is a metal material, but has an interesting property that it doesn't feel slippery like you would expect with a smooth metal surface. This is because the surface, while being smooth, offers a good amount of friction for your hand. I'm very impressed by this, and even a little bit surprised, as it completely ended my worry about it being slippery after some stressful and intense gaming. A great little feature of the SteelSeries Sensei is its ability to alter the color of the lights on the mouse. Offering up to 16.8 million colors, you can set it to the exact the color of your choosing. The ability to adjust the CPI (Counts per Inch -- basically, what SteelSeries think is the correct term for DPI) on the fly between two settings is handy, and the best part is you can customize the color of the light to indicate which setting you are on. You keep the same color if you want a consistent look, though. The customization options are really in your hands with the SteelSeries Sensei; no pun intended. The most striking feature is its symmetric design, which allows for the lefties to get the all of the features out of this mouse. The Sensei is full of wisdom for me, as it taught me something about how I should use a mouse. The buttons on the right side happen to reside exactly where my ring finger is. This is really annoying, because by simply resting my hand on the mouse, I hit the upper right side button. I guess over the years, I should have been using my ring finger on my right-click, I never thought about it until using the Sensei. I better start breaking my sixteen year habit of middle finger right-clicking, which originated from when mice didn't even have a scroll wheel. In case you don't get it, I am saying this with a tone of sarcasm. The bottom of the SteelSeries Sensei is an interesting one, as you will notice the large Teflon surfaces around the edges. This is great, because it ensures smooth and low friction glide, which is exactly what you want when playing games or doing graphics design. I do admit it has one missing feature that really bothers me, and that is the lack of weights to customize the mouse's mass. Personally, I like a heavy mouse, and being only 102g, the Sensei feels like a feather to me. It is almost uncomfortably light. On the plus side, if you like a lightweight mouse, the SteelSeries Sensei is perfect, but the ability to customize the weight would really bring this mouse from 'great' to 'exceptional'. In the middle is the laser based sensor, which is able to handle a wide range of CPI settings, advertised as being from 1 to 11400. The reason I say 'advertised' is because when I was using the software, the lowest setting allowed was actually 30. It is rather odd to indicate it can go lower, but not provide the ability to set it lower. However, in their defense, who would use a mouse at that low of a setting? One unique feature on the bottom of the Sensei is the LCD display. Now why would a mouse need an LCD, and why would it need it on the bottom? Well, good question -- here is the logic behind this feature: You can setup a custom display for the mouse to easily distinguish it from someone else's if they have the exact same one at a LAN party. Secondly, you can adjust the mouse settings from the LCD when you plug in the mouse to a computer without any software installed. This is an extremely handy feature, especially when coupled with the ability to set up to five onboard profiles. There is certainly some excellent innovation, and SteelSeries has shown me that a mouse can be built as a fully isolated embedded system. I am thoroughly impressed, yet again. The installation process was pretty reasonable; however, encountering a crash during the initial update to the mouse caused me to have to search for how to fix the problem. This left the mouse in a broken state before I could use it, forcing me to hunt down the firmware repair tool. However, aside from the crash, the installation and update process for the SteelSeries Sensei was painless and very easy. Once everything was installed, it was time to use the software to configure my mouse. Admittedly, I have never used SteelSeries Engine before, so after playing around with it for a little bit, I basically understood how everything worked. I'll give some credit to them for designing easy to use software. One feature that would have been really nice to have is the ability to create the custom bitmap in the program. Considering you can do it on the website, I'm not sure I understand why it isn't in the engine software for the mouse. As you can see in the picture above, I set the colors to blue for it match my Logitech G15 keyboard, and SteelSeries provides a very easy way to configuration. For the other settings, I had to play with a little bit before I found my comfort zone with them. Overall, I have totally enjoyed the level of flexibility offered; it goes far beyond the basic DPI and button assignment on most gaming mice. Setting onboard profiles is extremely easy as well, which is great, as it allowed for me to setup profiles and put them on my mouse when I decide to use it on a different computer. It would have been nice if the software used a busy cursor when it was off chewing away on something, but this is typically overlooked by software developers. When it came to assigning buttons on the mouse, it was extremely easy, and macros were simple to do as well. Overall, it was a very pleasant experience. Another notable feature was the ability to easily switch to left hand mode. It is something I will never use, but for anyone who uses the mouse with their left hand will be glad to see this. The statistics panel is also a very interesting feature. Here, you can set Engine to record all of your actions, so that you know how many clicks you did, and which buttons you have engaged over a period of time. I can see where this would be useful for professional gamers. As an amateur gamer, however, this isn't something I will be using regularly to optimize my game. For purposes of testing, I've been using the SteelSeries Sensei for roughly two weeks, and have compared it to my Logitech G5 V2 I have been using for countless years. A lot of the testing was doing "office-type" work; the quotations are because my main activity is programming, and not the typical office work that most people would be doing (I am a software engineer). I also have been playing The Elder Scrolls V: Skyrim for a week with Sensei, so that will be my primary comparison for gaming. Being able to have the mouse change configurations when launching applications is almost expected with a gaming mouse. It was definitely easy to set up multiple applications per profile, and it worked with the couple of games I have tried. Now the real question is, how well does the mouse perform in games? After using it for quite a bit, the SteelSeries has slowly grown on me, and in the end, I will use it over my Logitech G5 V2 for a number of reasons. First reason is the Sensei has more mouse buttons, and with the ability to store multiple profiles for on the go, this is very convenient. Second reason is the mouse is able to work on almost any normal desk surfaces, and even many not-so-normal surfaces, including clear plastic and even glass. Third reason is because the level of control and precision of the mouse is simply amazing -- SteelSeries' ExactAim not only allowed me to have normal mouse motion most of the time; it would also drastically enhance precision for small motions. It is absolutely amazing, and made shooting arrows in Skyrim significantly better. It is really hard to find anything that I could not customize about the Sensei when it came to usage. Overall, the quality and comfort of using the mouse in game was an almost unreal experience, and was the final peg in my decision to put away my tired Logitech G5 V2. As far as daily use goes, the enhancements provided by the SteelSeries Sensei weren't overly noticeable, except for when I was working with graphics. The location of the CPI switch button on the mouse is a bit lower than I would have liked, but not too low to be difficult to press. Overall, this mouse really shines in games and with graphic design. As a gaming mouse, office work can go on hold as I go off and slay some dragons! In conclusion, I can summarize this mouse with one word: Awesome. The only serious flaw with the SteelSeries Sensei was the lack of ability to customize the weight of the mouse. However, this isn't enough to make this mouse not worthwhile, but if this mouse allowed me to change the weight, I would have an extremely hard time finding anything at all other than a few very minor drawbacks. The features provided by the SteelSeries are just game crushing, and the flexibility for the user is nearly limitless. For a professional gamer, this laser mouse is a dream, and will definitely improve your game. For average users and casual gamers, this mouse might be on the upper end of what you are willing to spend, as it retails for about $90 at press time. However, it is a top of the line mouse, and for this reason, this price is absolutely reasonable. The ability to store profiles and settings on the mouse so that you can take them with you to other computers is a huge advantage. The ability to adjust the mouse using the built-in LCD without installing the software is just incredible. Setting and creating profiles on the fly really just bring in a whole new level of customization to the table. I just can't believe how spectacular this mouse is overall, and how much it has to offer. At the end of the day, I would totally bring this mouse with me to LAN parties. The only thing I will be worried about is it being stolen, because it is simply too good. While pointing devices may have first been developed 50 years ago, the Sensei redefines what we call 'awesome'. SteelSeries provided this product to APH Networks for the purpose of evaluation. The SteelSeries Sensei is a true master of the mouse world, and can teach everyone something about what being an exceptional is all about. Do you have any comments or questions about the SteelSeries Sensei? Drop by our Forums. Registration is free, and it only takes a minute! posted 12 hours and 34 minutes ago, with 6 posts. posted 12 hours and 34 minutes ago, with 5 posts. posted 12 hours and 35 minutes ago, with 13 posts. posted 12 hours and 36 minutes ago, with 57 posts. posted 12 hours and 36 minutes ago, with 12 posts.